For the past several months, I’ve really been watching what I’ve been eating. Basically this translates to me bringing my food with me everywhere I go, even to friend’s houses. Now that I’ve fully embraced the Even Happier Quest, I’ve decided to lighten up in as many life areas as possible. One of these is to eat out if I want to and not always carry my own food. Because I’m pretty frugal, I still plan to make my own meals most days and take food part of the time. I just won’t be as rigid about not eating at restaurants or at other homes. It’s been interesting to explore options out there. Lots of restaurants now have an online nutrition calculator. You add items and create your meal, then you can customize options. You can add or subtract whatever you want and it recalculates the values for you. How cool is that?! A new toy to play with and I get to eat out! 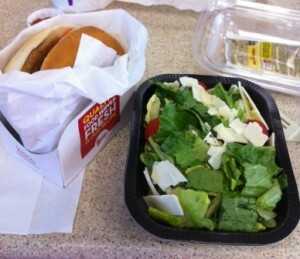 Tonight we settled on Wendy’s because I was lazy and I just didn’t want to make dinner. I could have, but I chose to live free and lighten up. I was thrilled to customize my meal with the Ultimate Chicken Grill Sandwich (no bun, no sauce), a garden side salad, and a caesar side salad. Add in a half packet of dressing and the meal came to 260 calories. That’s pretty cool. I had no idea those options were available for so many restaurants. I have only used it for chipotle in the past and that was eye-opening. Some are downright scary. Agreed! Even salads are over 1000 calories at some places. I hope this is a new trend to allow you to customize your order. I’ve found about 25% of the big chains do that – Red Robin, McDonalds, Wendys, etc. Lots more at least post their calories even if you can’t change toppings.